Frida Kahlo was born on July 6, 1907 and is considered one of Mexico's greatest artists after she was in an accident that severely injured her. 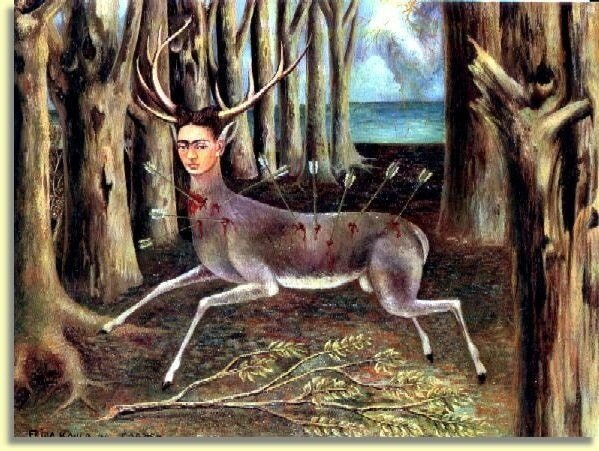 Frida has created several art pieces that show how she felt through this trauma she went through. She married another artist called Diego Rivera in 1929 and became politically involved. This project depicted several different Frida paintings and art that symbolized a person we each chose. With the art we made, we wrote a biography about them in Spanish that lasted to about 300-600 words. My Frida was my brother, James Vance, and I picked him, because he is a unique individual that loves to shoot and more things that are fun to write about. At the beginning of this project, I wanted to photoshop my brother and combined it with the Frida elk body painting, but I then later started to sketch out my idea, and ended up liking my sketch more, rather than photoshop. So, mine came out as an elk with a Frida head with antlers to represent my brother's love for shooting objects, especially elk.